Protector Series black compact bow case holds a parallel limb bow. 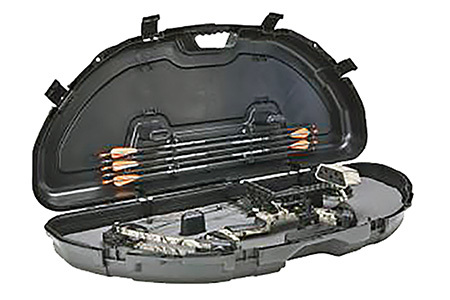 The compact design features arrow storage under the lid and will securely hold both aluminum and carbon arrows. It has thick wall construction and high density foam to protect with a patented PillarLock System and a comfortable molded handle. The case is lockableairline approved. 43.25 x 19" x 6.75"."